Chumby was all the buzz at Foo Camp this weekend in San Francisco but what the heck is a Chumby? Chumby is a new device that was created by and for hackers and artists. 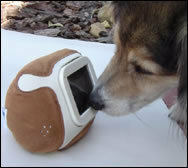 Chumby was started as a device to replace the humble clock radio. So Chumby can be used to wake you up in the morning as well as to bring the web and other technology to you at your bedside, kitchen or anywhere else you take the device. The device was kept "open and hackable" so artists and hackers can take the device and come up with new innovate devices using it as a base. The device is not yet available for purchase but is said to be priced at $150. Chumby takes shape as a soft and squishy, rounded rectangle with a flat screen on one side. It offers no keyboard or other input devices other than its squishy surface. The device can also be personalized by added beads, stickers or other flair to make it your own. Chumby's "open and hackable" strategy could spark the creation of several unique products and uses (similar to duct tape's infinite uses). It is already positioning itself to be a cult classic. Let the innovation roll!